A small business in northern New Brunswick has developed a product that could revolutionize an entire industry. Green Kore in Bathurst has created a new type of bullet that is accurate, easy to manufacture and cheaper to produce—it also just happens to be lead-free. Lead poisoning is a huge environmental issue on military training facilities, with the U.S. military typically spending $20 million per practice range to clean up lead contamination. And in times of war practice ranges see more use, which means they may be cleaned several times a year. Lead poisoning can be a health hazard in ammunition manufacturing plants where factory workers handle the lead every day, cutting, snipping, forming, and generating dust. Lead contamination is even a concern in sport hunting. 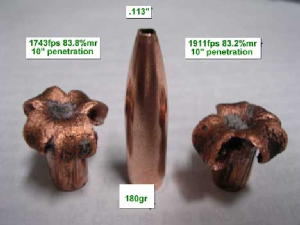 With Europe set to totally ban lead this year and the U.S. Military planning to phase it out by 2008, many companies have tried and failed to invent an accurate inexpensive lead-free bullet. Recent studies have also shown that the so-called “green bullets” made from tungsten-nylon are not very environmentally friendly afterall. Last February, Massachusetts Governor, Mitt Romney, banned the use of tungsten-nylon bullets at Camp Edwards on Cape Cod. Researchers found that tungsten powder could leach through sandy soil and into drinking water. A water sample taken last year contained tungsten in concentrations as high as 560 parts per billion. A large American ammunitions manufacturer that is currently testing the Green Kore material has already tested 57 other products, which either performed poorly or cost too much to introduce into their production facilities. “It’s a long testing process that will probably take months before it goes through but it looks good, so far there’s been nothing negative,” Kyle says adding that if Green Kore can successfully introduce their new lead-free technology it will change the bullet industry. NRC-IRAP provides technical and business oriented advisory services along with potential financial support to growth-oriented Canadian small and medium-sized enterprises. The NRC-IRAP was really instrumental in getting the resources to help this small business go down the right path. Over two years ago Sisk approached Kyle, president of the Industrial Rubber Company, with the question of whether rubber could stick to metal. 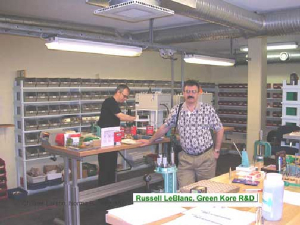 Sisk had a client in Nova Scotia named Russell LeBlanc who designed bullets. With LeBlanc’s ballistics expertise and Kyle’s knowledge of industrial rubber, they teamed up to design the Green Kore material for lead-free bullets. “Bullet design is somewhat of a mature industry,” Sisk says. “Lead is necessary in traditional design to create mass.” In the past if you used another substance performance and accuracy suffered, but the Green Kore material performs well within industry standards and is very flexible for manufacturers to work with which makes replacing lead easy for them. 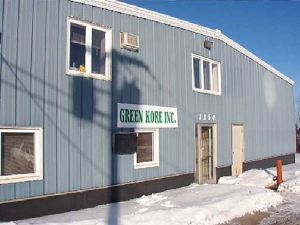 Green Kore hopes to start a small production in Bathurst creating between five and 75 new jobs, depending on how fast their new lead-free technology takes off. “The personnel is here. We would not have to leave, that’s for sure,” Kyle says. Kellie Underhill is the Editor of Bread ‘n Molasses online and in print.A director of the Writers’ Federation of New Brunswick, Kellie is also an associate editor of Galleon literary journal and on the editorial board of Broken Jaw Press.